It sticks like a static cling type sticker. You can take it off simply by peeling one of the corners back and pulling it off. If you want to reuse it, you need to re-wet the window and just reapply it. It lets in a lot of light and offers a lot privacy! We did every other pane in the window so we can still see outside. The material is fairly easy to cut to approximate size and trim after application with a utility knife. When you want to remove it,It does not leave behind any residue. You can peel it off and reposition it with no problem. 2.A Cool,Smooth Surface With No Texture of Any Kind. 3.Wet Glass With Soapy Water. 5.Install The Films To Glass. 6.Squeegee With a Smooth Tools. 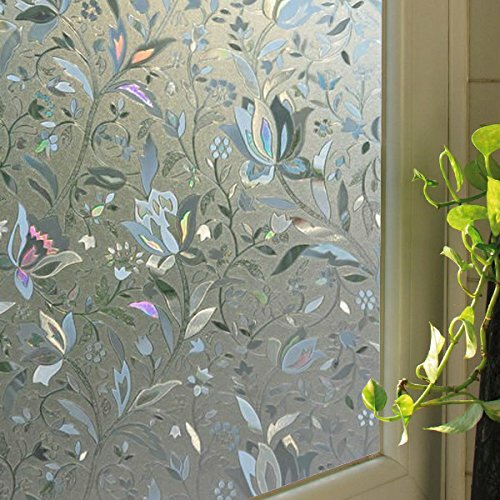 Get the look of frosted glass with easy do-it. Using static cling with no adhesives, removable and reusable. Softly filters light while providing privacy. If you have any questions about this product by Leyden, contact us by completing and submitting the form below. If you are looking for a specif part number, please include it with your message.